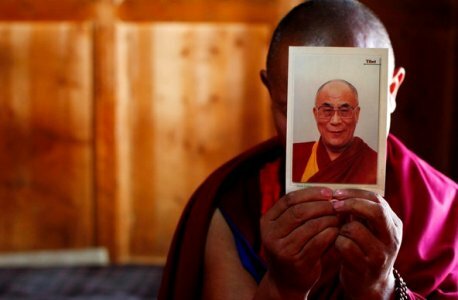 In an abrupt and unexpected reversal of policy, Chinese government officials have told monks in some Tibetan areas that they are now free to “worship” the Dalai Lama as a “religious leader.” The new policy document—prefixed with the word “experiment”—also asked that the monks now refrain from “criticizing the Dalai Lama,” and “stop using such labels as a wolf in a monk’s robe,” a common pejorative hurled against the Tibetan spiritual leader by Beijing. The announcement was reportedly made during a conference held on June 14 at a so-called Qinghai Provincial Buddhist School where a new party secretary was appointed. It was attended by high-ranking ethnic Tibetan and Chinese officials, according to the Tibetan language website Khabda.org, which reported the news. Analysts say that the Chinese government might have been forced to rethink its strategy on Tibet following more than 100 self-immolations that have occurred inside the special administrative region since 2009. “If that document is genuine, then they are trying to diffuse the pressure of the self-immolations,” said Thierry Dodin, director of the Tibet Information Service, TibetInfoNet in London. The new policy is to be first implemented as an “experiment,” according to the report. Dibyesh Anand, Tibet specialist and associate professor at Westminster University in London, sees no evidence of a major shift and says that this can be best explained as an experiment at the local level. When the Communist Party of China (CCP) initiates a new or major policy change, they usually prefix it with the word “experimental,” which means that if it works they would apply it nationwide, if it fails would be dropped from party’s policy. China is slated to announce a new policy in August. Some believe the new policy is a public relations offensive in the wake of much criticism toward the Chinese regime from the outside world, especially human rights organizations in the aftermath of the series of self-immolations. “No criticism of Dalai Lama is more to do with smarter public relations propaganda … rather than a genuine effort at reconciliation,” Anand said. However, a similar announcement was also reportedly made lifting the ban on the displaying of the Dalai Lama’s pictures in homes and monasteries around the town of Dram near the Tibet-Nepal border, triggering hopes that China might be interested in easing its control on religious practice on a much wider scale. Beijing’s policy change might also be aimed to send a signal to the outside world that the new leadership is interested in changing its policy toward the Tibetan spiritual leader, said one leading Tibetan scholar. “It is an indication of change,” said the scholar, who did not want to be named. Making it even more interesting is that the news comes on the eve of China’s forthcoming tour of Tibet by foreign journalists. Recently, a few other articles have raised speculation that there might be an olive branch in the offing from Beijing authorities to the Tibetan leadership in exile. In an interview with Hong Kong-based Asia Weekly, Jin Wei, a director of ethnic and religious affairs at the Central Party School at Beijing think tank Central Party School, also suggested that China’s policy in Tibet may not be working. She called for restarting negotiations with the Dalai Lama’s representatives and has proposed that the Dalai Lama might even be invited onto Chinese soil, Hong Kong and Macau as well discussing the issue of reincarnation with the Dalai Lama himself. Tibet watchers believe that it is best to adopt a wait-and-see approach if the China government matches their words with actions. “If she really is transmitting a message, then we should take note of it and wait and see first because what they say does not matter, you have to see what they actually do on the ground,” Dodin said. Given China’s hard-line policy, Tibetans have demonstrated a mixed response to the news, ranging from guarded optimism to outright skepticism. Since 2009, as many as 119 Tibetans living under China’s rule have set themselves on fire demanding freedom and the return of the Dalai Lama from exile. 102 of the self-immolators died in agony while the condition of more than 10 remains unknown. Tsering Namgyal, a journalist based in New York, is the author of a new biography of the 17th Karmapa Ogyen Trinley Dorje published last month by Hay House, India. He is also the author of a recently published novel, The Tibetan Suitcase.